High-efficiency dryers significantly reduce production and drying times, improve product quality, maximize product recovery and minimize environmental and worker exposure. 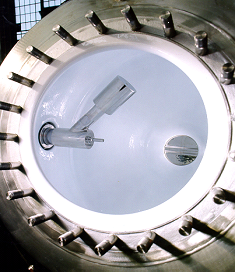 DDPS dryers feature unique vessel and agitator designs that meet the most stringent pharmaceutical specifications. Our easy to clean dryers are available for both dedicated and multi-purpose applications. In order to ensure proper selection of drying equipment and fully operating systems, we have a state-of-the-art test facility in Europe, as well as a US rental fleet for on-site customer testing. It can be used for dedicated or multi-purpose applications and it provides the best in product quality, total discharge, cGMP production, cleanability and limited operator exposure. 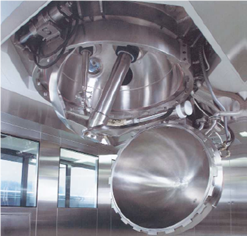 The Spherical Dryer can be provided in two unique configurations to meet your process needs. 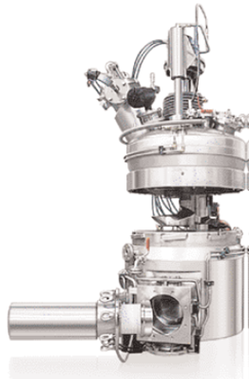 The universal dryer features a high-speed, removable chopper that breaks up lumps of wet or dry agglomerates while providing additional mixing capability, shorter drying times with the highest possible fill volume. 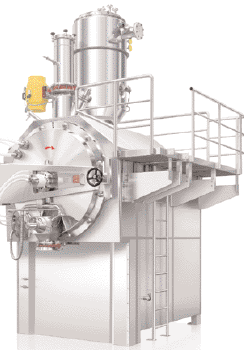 The Universal Dryer is ideal for difficult drying processes that involve drying, mixing, milling, granulation, evaporation and/or crystallization. Since the product area is completely contained, this product is appropriate for pharmaceutical intermediates and fine chemical applications. The Universal Dryer features a horizontal construction with an integrated agitator/chopper system and full-area heating. A hydraulic, encased drive for the agitator and chopper ensure a consistently high torque. The hinged front door, which can be quickly and easily opened for inspection, provides access to the entire diameter of the cylinder. The dryer can even be filled between 20-90% of total capacity and still retain optimal agitation, mixing and drying performance. Even with low rotational speeds allowing the dryer to be filled between 20-90% of total capacity and still retain optimal agitation, mixing and drying performance. Addition of fixed stator to agitator systems for decreased particle size of product. Based on the well established and proven Filter/Dryer technology, agitated pan dryers are differentiated by their heated flat bottom plate that effectively enlarges the heating area of the vessel. 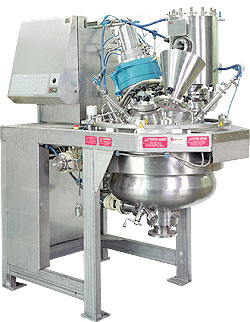 It is specifically designed for the batch drying of solids and uses a unique "vortex" mixing action for improved drying performance. Available with top or bottom entry-drive technology, the pan dryer comes equipped with a speed-controlled, heated agitator that facilitates short drying times. The pan dryer also features a side discharge valve that enables simple emptying. As with the spherical dryer, the mechanical seal of the pan dryer is also advantageously located outside of the product area. The axial motion of the agitator is sealed by metal bellows, as with the Filter/Dryer. The minimal agitator to wall clearance keeps the wall free from product crust. The pan bottom can be easily lowered for fast cleaning (CIP/WIP and SIP) and inspection. The SR series glass-lined steel rotary dryer/blender combines the drying and mixing function in one simple and stable device. 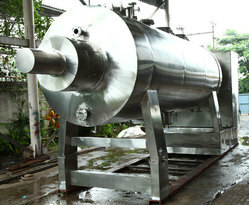 The rotation of the double cone allows the product to be mixed and dried without an internal agitator. The design is suited for processing easily flowing, corrosive products for drying, mixing or concentrating pharmaceuticals, dyes, pigments, synthetic resins, etc. Carbon steel inner vessel lined with 3009 glass. EasyLift™ Manway Assist with GasketSav'r™ and PTFE-lined and bonded protection ring for the charging nozzle cover. Steel conventional jacket welded to the inner vessel, including all nozzles necessary for heating. The drive side is fitted with a rotary union to feed the heating medium. It also houses the drive assembly consisting of a spur gear drive, motor break and inverter duty explosion proof motor. The vacuum side support is fitted with a Hastelloy C vacuum tube. The vacuum tube is sealed by means of a mechanical seal with PTFE bellows and ceramic seat. The vacuum tube also houses a thermowell. The operation and maintenance costs are very low. In many cases, it is possible to reduce batch time. Volumes from 100 to 7,220 liters (30 to 1,900 gallons) or 12.5 to 203 ft² of heating area. "Clean room" version with minimized dead zones and remote control for filling, emptying and cleaning functions. 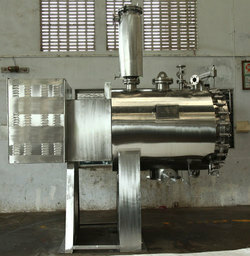 The rotary vacuum paddle dryer (RVPD) is a complete drying system used to obtain dry powder from wet cake or solutions. The drying operation is generally a batch process and is often carried out under vacuum. The product is heated through direct contact with the heated vessel and agitator surfaces. The heating of the dryer can be accomplished by use of steam or adequate heat transfer fluid. The hollow rotating agitator shaft imparts heat to the product, scrapes the shell wall, tumbles the product for maximum heat transfer and discharges product when required. User friendly design provides vacuum tight closing when the material is processed and quick opening facilitates filling of bags when material is discharged and packed. Full door opening for ease of operation, cleaning, inspection, and validation. Mechanical Seal to avoid product contamination. Clean area installation with stainless steel partition wall between the process area and the drives. Machined and mirror polished inside surfaces with PTFE Scrapers. Low operating costs compared to other types of dryers. Large heat transfer area available on paddles and shaft give maximum heat transfer rates. The scrapers have minimum calculated clearance from the shell to keep the shell clean and increase the heat transfer co-efficient.